Unique horror films, twisted tales that askew religious doctrine, musicals, lavish theatrics and eye-popping visuals… these are a few of my favorite things. In full disclosure, I may be incapable of objectively reviewing Alleluia! 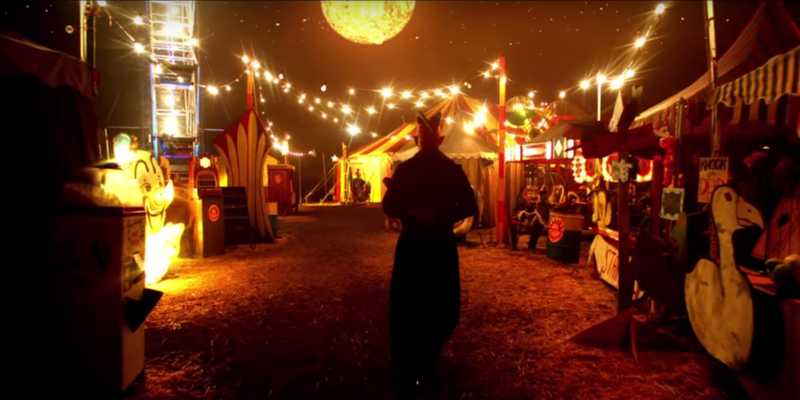 The Devil’s Carnival. The mere fact that a film like this exists is reason enough for me to sing its praises. This is a movie that unapologetically caters to its very niche audience and embraces its weirdness with gleeful abandon. It’s certainly not for everyone… and that’s in large part why I think it works so well. Alleluia! 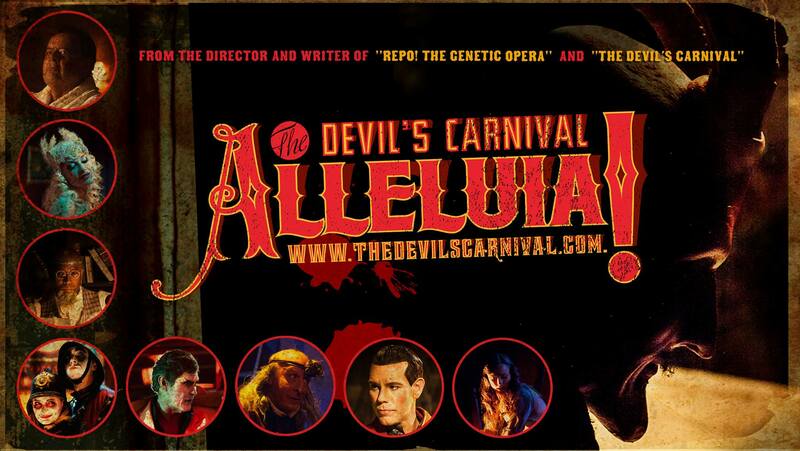 is the sequel to 2012’s The Devil’s Carnival. This marks the third musical cinematic collaboration from the brilliant duo of Darren Lynn Bousman (director) and Terrance Zdunich (writer/lyricist/star), who previously teamed up to bring us Repo! The Genetic Opera. 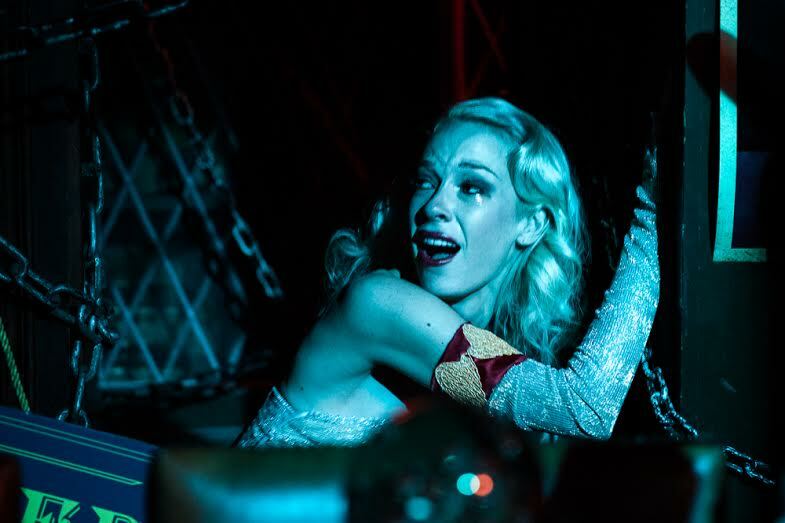 The Devil’s Carnival introduced us to a fantastical underworld, where Lucifer (Zdunich) runs a colorful carnival for lost souls, and the damned dance and sing their troubles away. Alleluia! shows us the other side of the afterlife, with a look at the beautiful but oppressive Heaven. Depicted as a 1940s-style movie production company, God (Paul Sorvino) reigns supreme as CEO. The movie begins with a bang, throwing us right into the action and kicking things off with an epic musical number led by the brilliant Zdunich. We start aboard a roaring train, headed by Lucifer, transporting a band of lost souls to the doorstep of Heaven. 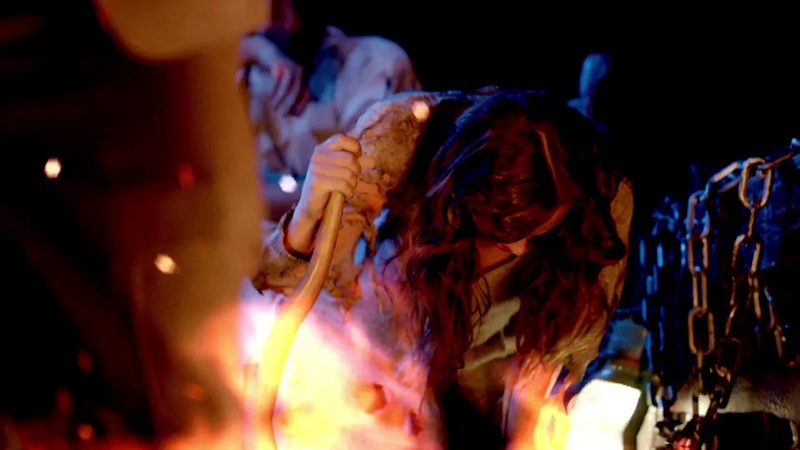 It’s an act of overt rebellion designed to fuel the flames of the growing tensions between the two afterworlds. The scene does a great job establishing the tone of the film and setting up the central conflict. After the powerful introduction, we get to the crux of the story about one girl’s fall from grace for the “terrible sin” of curiosity. Satan tells the story of unfortunate girl, June, who dared to defy God, while entertaining a mysterious hooded visitor in his private quarters. Through the story, told in flashback, we get a glimpse of the perceived cruelty of Heaven from the Devil’s perspective. Alleluia! is a veritable feast for the senses. Bousman manages to create a world that is both nightmarish and beautiful. Every frame is exploding with attention to detail and an astute eye for visual design. The colors pop off the screen, including the deep blues and brilliant reds, reminiscent of classic Argento. 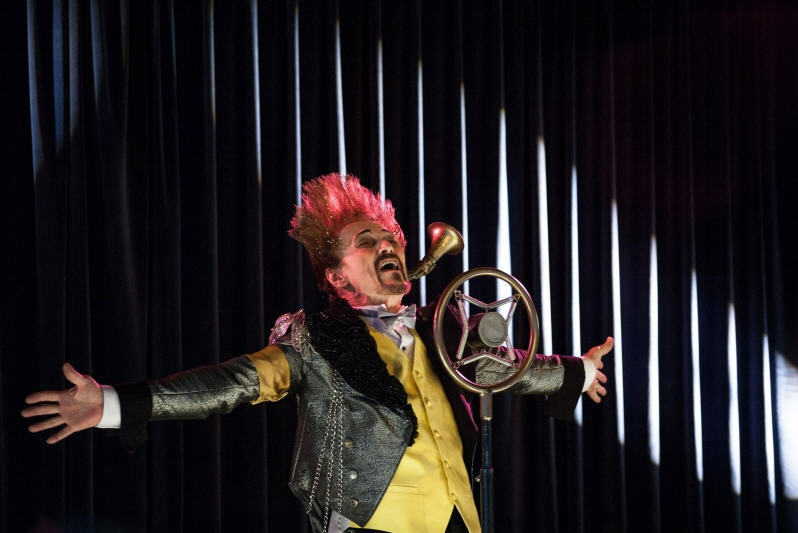 Part funhouse freakshow and part old Hollywood glamour, Bousman creates a completely original and visually awe-inspiring universe. For his part, Zdunich (working with talented composer Saar Hendleman) delivers another show-stopping production and an unforgettable soundtrack, paying homage to the best of musical theater and the golden age of musicals. With an impressive 14 musical numbers, each song serves to heighten the emotions of the actors and progress the storyline. This is a film that celebrates the ultimate in true creative expression. In entirely eschews mainstream sensibility in favor of something delightfully strange and utterly unique. Equal parts horror, musical, comedy, and dramatic morality tale… this is a film that lovingly embraces its quirky, anti-establishment sensibility. The genius of this film, besides its numerous and quite catchy musical numbers, is its inspired casting. 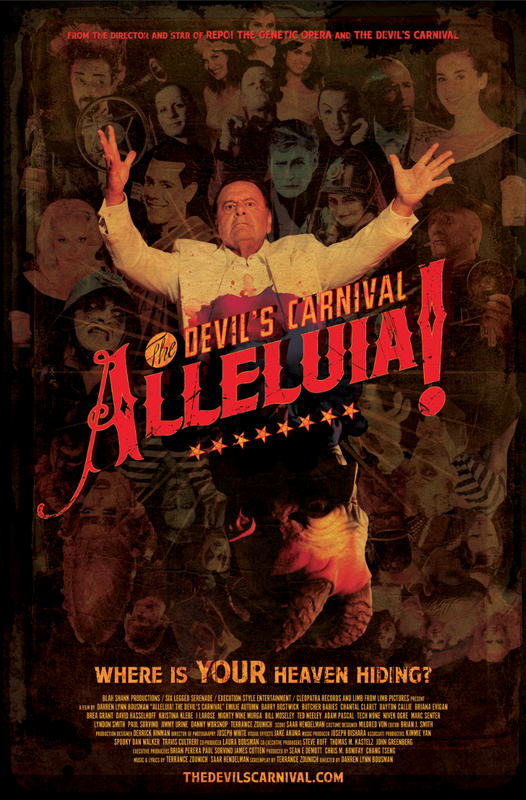 A true ensemble cast, veterans of The Devil’s Carnival shine in the sequel, including Paul Sorvino and the Victorian goth-rock songstress, Emilie Autumn (in a dual role as the doomed June and The Painted Doll). In an effort to up the ante from the first film, new acts are brought in to “jazz” up the world of Heaven. David Hasselhoff plays a flamboyant stylist, delivering a strong and sincere performance that is neither campy nor ironic. The rapper Tech N9ne is brilliant as the strict, rule-enforcing librarian. We even get a rousing performance from the great Ted Neeley, Jesus Christ Superstar himself, as God’s publicist and band leader. One of the strongest additions to the cast is Adam Pascal (School of Rock, Rent, SLC Punk! ), playing God’s most faithful servant and right hand man. Not only does his character add heart to the story, but he also adds the proverbial soul — crooning in a smoky jazz club and belting out one of the most memorable tunes of the film, “Down at the Midnight Rectory”. Looking past the surreal visuals and the heavy-hitting musical numbers that dominate Alleluia!, Bousman and Zdunich clearly have some rather deep and meaningful things to say about religion, questions of morality, and the complicated notion of good and evil. This film paints Lucifer in a much more favorable light than God, who comes off as an uncaring and selfish bully. In fact, Alexa Vega (who played Wick in the first film) declined to appear in the sequel because she believed the movie was sacrilegious. While the surface of Heaven is all glitz and glamour, the undertones are decidedly dark. The rules are rigid, and the slightest infraction leads to severe punishment. New arrivals — designated as applicants — audition for a role in Heavenly Films Productions. Each applicant is given an armband, uncomfortably reminiscent of fascist dictatorships, which represents their designated station. All of the stations are named after animals, with those at the top receiving special privileges and access to God, while the lower levels are relegated to slave labor. The film subtly, but powerfully, deals with issues of censorship, hypocrisy, homosexuality, patriarchy, class systems, and blind allegiance to authority. Much of the most damning social commentary comes from the Devil himself. He calls God a “pious gangster” and a “divine pretender”. 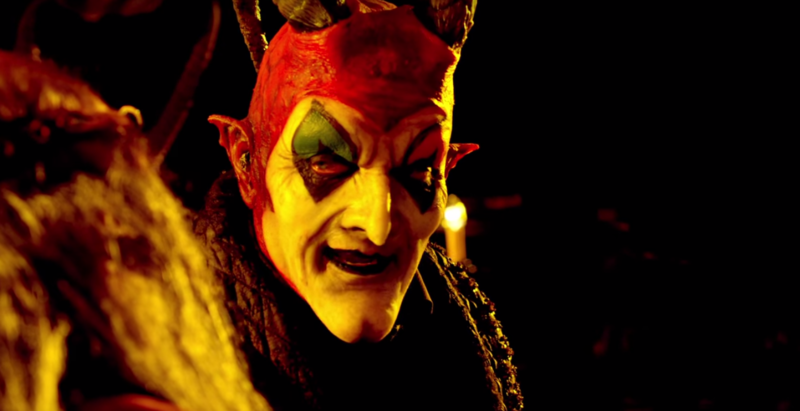 While not completely necessary, I’d recommend starting with The Devil’s Carnival before tackling the sequel. Both films are now available to buy or stream. If you’re a fan of Repo! 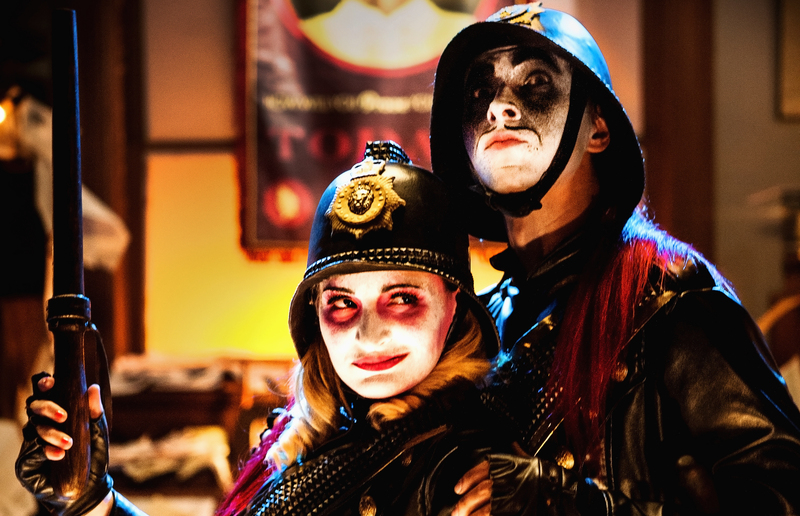 The Genetic Opera and Rocky Horror Picture Show, I think you’ll find a lot to love about these odd but incredibly charming gothic musicals. Even if this psychedelic mash-up isn’t entirely your cup of tea, it’s hard not to truly appreciate the effort. Bousman and Zdunich are icons of renegade, punk-rock filmmaking. With a “damn the man” attitude, the duo set out to make the exact film they want to make… the exact way they want to make it. The quintessential definition of the indie spirit, Alleluia! challenges traditional filmmaking conventions in both content and execution. This is a movie that celebrates the misfits and outcasts. It wears its weird badge with gleeful abandon, letting its freak flag fly with unabashed pride. It’s not a film for everyone, but that’s what makes it so special. It’s a film made with unquestionable integrity and passion… and one that is hard not to love. It’s worth noting that Alleluia! is the second installment in what is intended as a three-part saga. As a result, this is more appetizer than main course. It teases an epic battle between Heaven and Hell, but we never get to see the meaty showdown we’re salivating for. While this may leave some unsatisfied, I’m thrilled for another serving of this tasty franchise and fully expect the wait will make the payoff that much sweeter.